Home Case Studies Biggles B. First Entry, November 12, 2011: Biggles was born from a stray in our neighborhood. She was a sweet girl that deserved a better life but we did our best to at least keep her fed. She had two litters; Biggles was born in the spring, 1999. His litter was of your normal variety a few orange tabbies, a gray tabby and a few torties. Biggles has had a few health issues (upper respiratory infection, lower urinary tract infection), but overall a healthy cat for most of his life. Biggles has always been a bit picky, to say the least, about his food. He has never eaten wet cat food, we have tried every brand and flavor we can find that looks like human food. But there is something about it that tips him off that it made for cats. He liked Max cat food until they changed the formula and he immediately turned his nose up at it. We were given a recommendation of Felidae which he showed interest immediately. In August 2011, I noticed one morning that Biggles was hanging around the water dish. He seemed a bit down (lethargic), and was not really interested in his food. He had vomited a few times in the last few days and I also noticed lip smacking. I tried to give him some cheese, another of his vises, which he also showed no interest. We called his vet and they had us bring him down. They gave him fluids and took x-rays and did blood work. They diagnosed him with severe pancreatitis. At this time, he weighed 12 lbs 6 oz. There was severe inflammation around the pancreas. They recommended that we bring him to the veterinary specialist center in our area for additional testing (ultrasound), and extended fluid therapy since he was severely dehydrated. Ocean State did an initial physical exam in which they pushed on his stomach. Biggles growled which showed that he was painful. They also detected a galloping heart beat which slowed the fluid treatments (heart failure was a concern due to the heart condition with an aggressive treatment). The ultrasound was scheduled for the following morning. They admitted him and started him on fluids, anti-nausea medication, antibiotics, and pain killers to help with his discomfort. Low dose aspirin was also administered since blood clots can also develop with pancreatitis. The ultrasound showed no other concerns and they continued treating the pancreatitis. Biggles remained hospitalized for 6 days. He would not eat at all for them and did not use the litter box until they gave him some valium to relax him. They began syringe feeding him which he seemed to take very well. A feeding tube was recommended which we were very much against unless it was a last resort option to get food into him. Treating pancreatitis successfully requires providing good nutrition to the cat. Because Biggles is a very picky eater, we knew he would not eat what they were offering him voluntarily. After 6 days he improved considerably and they felt that having him home would help to get him to eat on his own. They advised a diet of prescription food (Royal Canin Recovery RS) and providing 5 to 6 small meals a day. We syringe fed him for about a day and then he began to eat enough on his own. We have been feeding him since his hospitalization, a diet of protein (chicken and beef), and have cut out much of the “treats” that may have contributed to his disease (cheese, cream). We continued with the low dose aspirin (every 72 hours), Pepcid A/C (every 24 hours), and cyproheptadine (appetite stimulant), (every 24 hours) for 2 weeks. We had a follow up appointment with our local vet 10 days later. Biggles was doing well by then. He weighed 12 lbs 4 oz at that time. There have been a few times that the Pancreatitis had seemed to have flare up, he hid and vomited a few times. But mostly he had done well with little symptoms of discomfort. I’ve given him Pepcid A/C when he seems to have some nausea. About a month later we thought the pancreatitis was bothering him and called our local vet. Biggles was showing the same symptoms as he had when he was first diagnosed with pancreatitis and he also was losing weight quickly. We brought him in and they did blood work and gave him fluids. Ocean state did mention diabetes when they hospitalized him in August (there was a small amount of spilling of sugar in his urine and mildly elevated blood sugar, attributed it to stress). Nothing was overly concerning at that time for them to go further with testing. Biggles had a blood sugar level of over 300 with ketones in his urine. An initial diagnosis of diabetes ketoacidosis was made by our local vet and we were again advised to hospitalize him. He weighed 10 lbs 6 oz. Biggles was admitted to Ocean State and given fluid therapy to fight dehydration. A chest x-ray and ultrasound was done. His x-rays showed nothing abnormal for a cat his age and the ultrasound showed some pancreas inflammation. But not as bad as when he was admitted in August. 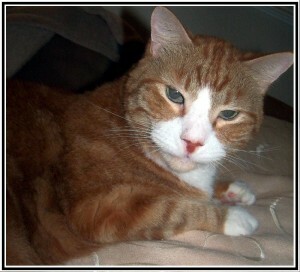 After a few days of insulin and fluids, Biggles was sent home with instructions and the treatment for diabetes was given. Biggle’s glucose levels had come down and he was responding well to the insulin injections. Biggles will be given 2 injections, of 1 unit of glargine every 12 hours after a meal. Biggles food (Felidae) was given an okay by his vet for being a good diabetic food. We will also stay on a high protein low carbohydrate and low fat diet. When Biggles came home he had terrible diarrhea and then was constipated for a few days. Both issues resolved themselves and have not been an issue since. A week after his treatment began for diabetes, a glucose curve was done on Biggles in which he stayed at the vets for the entire day. The vet was pleased with the numbers and she believes we should stay with the current insulin dosage. He had a spike of glucose in the morning after his injection, but stayed within good levels (under 200) for a good portion of the day and then nearing his next injection, spiking again over 300. He weighed 10 lbs. Biggles had a 3 week recheck Nov. 5th, with a testing of his urine. He had gained ½ lb since the beginning of October and the test showed no ketones in his urine and only slightly elevated glucose levels. The condition of his coat had improved greatly which was noted by one of the vet technicians. Biggles has been introduced to a wet cat food, Weruva, the Paw Licken Chicken variety shows to be a good diabetic food and high in protein and low in carbs. He took to it almost immediately. I am hesitant to try other varieties as the carbohydrate numbers are higher. Some contain vegetables which he will most likely leave anyway. Four days later Biggles woke up and was once again lethargic and not eating or drinking. I brought him to the vets early morning for evaluation. He was running a fever of 103.6. The vet treated him with subcutaneous fluids and antibiotics. Urine testing was also done in-house. He was sent home with a recheck scheduled later in the day. Biggles began to show slow improvement throughout the day. He was still not himself when I brought him back to the vet. Blood work was recommended to look for infection or a possible flare up of his pancreatitis. He was retaining the fluids given earlier in the day and his temperature had gone down by mid afternoon. The urine sample showed nothing of concern. She recommended antibiotics for 7-10 days or a long duration antibiotic injection. It is much more expensive than a bottle of Clavamox, but will ensure that Biggles gets the full affect. I went with the injection. The next day Biggles vet contacted me with the results of the blood work which showed some bacteria. She also noted that there was some indication in his blood work that he had a flare up of the pancreatitis. By that time, however, he was no longer lethargic and eating and drinking on his own. He will go back in 10 days for more blood work to check if the bacteria has cleared up. March 5, 2012: The follow up appointment in November, 2011 showed the infection had cleared up and his glucose and triglycerides were good. Biggles’ vet feels the dosage for his insulin is accurate. We will continue to monitor his glucose every 4 weeks going forward. Since December Biggles has been treated twice for lethargy and lack of appetite. The episodes occurred again in early January and then again in late February due to his pancreatitis. However, an additional issue with trying to regulate his diabetes continues to be addressed. Fortunately once a change in his behavior is visible, both episodes are very short in duration. Getting Biggles to his vet and administering fluids has been helpful in limiting the duration and intensity of his pancreatic flare ups. Usually within 8 hours of administering the fluids he is alert, active, and eating again. Biggles was also given a shot of diphenhydramine to help with nausea. The sign of a flare up for Biggles begins with him becoming finicky with the food he does enjoy. Then he only eats a small amount for a day or so. Then he doesn’t want to eat much of anything and he becomes quiet and withdrawn. Biggles vomited the morning we brought him for fluids. When he does vomit with a pancreatic attack, it is generally a yellow bile color. Note that he does not always vomit when he is not feeling well. We have had his blood tested (glucose, liver, and kidney values) and urinalysis done on both occasions. The only concerns that were seen were signs again of elevated bacteria in his urine indicating an infection. I allowed the antibiotic Covenia (January, 2012) to be administered which I have concerns about going forward. We have not administered any antibiotic as of yet for his most current episode. Other clinical signs showed a fever in January, but not the most recent time in February. Diarrhea was also seen in the most recent episode in February. Biggles’ vet attributes the reoccurring infections to not having his diabetes regulated which she noted can bring on urinary tract infections. This most recent episode showed Biggles having a high glucose number around mid day of over 300. He had a similar reading in January at the same time of day. The initial curve done in October, 2011 was in the 200s during the same time of day. Other items of note, Biggles very much enjoys the Weruva cat food variety of paw licken chicken. After a day or two of eating it, however, he has very bad diarrhea. This is very disappointing because as I have noted before, this is the only wet cat food he has ever taken to. I can only give it to him in small quantities as a treat. Biggles most recent pancreatic attack occurred on Tuesday, February 21st. As of today he is eating well, active, and is only showing a lingering issue of diarrhea. September 13, 2012: Since the last update given in March, 2012, Biggles has had no pancreatic attacks. Our local vet has provided us with the medical supplies to induce fluids at home should he become dehydrated and require fluids. But we have not needed to use it. We have more issues with regulating his diabetes at this point, however the lack of a pancreatic episode helps to lessen the concern with him not having a meal prior to his insulin shots. Biggles is now on 5 units of Glargine Insulin twice per day. He began with 1 unit in the fall of 2011. Although his glucose numbers are better, we are not seeing total regulation. We have done several curves over the last month. Our vet indicated that we may need to change the type of insulin at this juncture if more consistent results are not seen. Biggles has gained back a pound of his lost weight. He is alert and active and the only clinical visual sign of his diabetes is weak legs (neuropathy). But there is improvement in the strength of his back legs. In April 2012, our local vet advised us to seek a nutritional consultation. She continued to show concern regarding Biggles and his aversion to cat food. We also introduced a raw diet. He didn’t love it, but would pick at it from time to time. We met with a Tufts University nutritionist and she asked that we no longer feed him any human food. She was also concerned with a raw diet. Because of his diabetes, he would have a lower immunity to fight against bacteria found in raw meat. She gave us a variety of kibble, he did not like any of the samples. We were determined to remove the human food from his diet, which ultimately has happened. She also suggested that we give him more frequent doses of Pepcid A/C and not wait until he is not feeling well. I give him a dose a few times a month now for maintenance. She felt it okay to give him a 1/3 tablespoon of turkey baby food, with pulverized Felidae. He cries for it when you show him the baby food jar. He is not given this every day, but only when he is not as excited about eating just his kibble. We have tried to keep Biggles from grazing throughout the day, but he still begs to eat at times. We give him a small amount of Kibble to satisfy him at those times. March 25, 2013: Biggles has been doing well since the last update in the Spring, 2012. He had one episode in late October, 2012 of what appeared to be a Pancreatic flare up. He was in the “meatloaf” position and would not eat for us during the morning. We were prepared to give him subcutaneous fluids by noon if he didn’t improve. I did give him ½ of a Pepcid A/C during the morning. We continue to give Biggles the ½ tablet of Pepsid A/C a few times per month and not only when he seems to not feeling well as recommended by the Tufts nutritionist. Biggles eats his approved food of Felidae Kitten/Adult formula, Friskies hairball treats (soft), and Whisker Lickens Tender Moments treats. He still enjoys baby food which helps to stimulate his appetite. We monitor his diabetes on a regular basis. He has had several modifications to his insulin injections due to low glucose levels when tested. His levels have fallen into concern around mid to late afternoon. This is 4 to 6 hours after his injection when the lowest levels are generally observed. Levels have fallen between 60 -70 mg/dL several times over the winter months. This was at 4.0 units of Glargine (2 times a day). To ensure that Biggles diabetes was still regulated, a Fructosamine test was done at our local vet in late December, 2012. When the fructosamine level is measured, it helps determine the average glucose level for the previous 2 to 3 weeks. Fructosamine monitoring is often the preferred method for monitoring the glucose level in cats because it is not affected by stress, which can cause a sharp increase in the blood glucose level and not give a true reading. The test showed that Biggles had a level of 420 which showed his diabetes was regulated. Due to concern with Biggles preferred eating later in the morning then when he first wakes up, we have changed the course of treatment to a graduated level of 3.5 units when he eats an acceptable amount of food and only 2 units when he does not eat enough at breakfast or dinner. Our highest concern is in the mornings when he does not eat a lot before we have to give him his injection before leaving for work. It is not that he is sick and not feeling well enough to eat. But he prefers to eat later than 6 or 7 am. Biggles weight is good. (12.9 lbs). The weak back legs (neuropathy) have resolved and Biggles can jump up to counter height. Biggles is doing very well and has had little issue with his overall health during the last year. October 16, 2013: Biggles had his annual check up in August, 2013. With having little issues with regulation of his diabetes and only an occasional digestive issues, there is little to update from our last entry. He continues to be on a graduated insulin regimen. If he eats well, he will get 3.5 units. If he does not, we are instructed to give him 2.0 units of glargine. This has eased our mind particularly when leaving him for the day when we go to work. We continue to give him a dose of Pepcid A/C (1/2 tablet) a couple times per month. We are to only check his blood sugar levels every 6 months unless we are concerned that he may be becoming unregulated. Signs would be increased thirst and urination, increased hunger, and losing weight. A few weeks ago, Biggles had a few days of digestive issues. With added Pepcid A/C dosages, the issues resolved in a few days. He vomited 3 times in a 2 day time span. We have not seen this in almost a full year. He seems fine now. We are going to watch his weight. He is well into 13 lb. range now and becoming heavier may also jeopardize diabetes regulation. Overall, Biggles continues to do very well. November 6, 2014: Biggles went for his annual checkup last week. Clinically he is doing very well. He is active, eating, and his weight is back to what it was pre-diabetes/pancreatitis diagnosis. A full panel blood work-up, urinalysis, and fructosamine test was performed. CBS/Superchem was exceptional (looked perfect was said). Great results for a diabetic cat. Urine showed a small amount of blood. This is okay for a cysto sample. No bacteria was seen. Mild proteinuria likely secondary to blood and will need keep an eye on going forward. Biggles thyroid level is creeping up. Is in high normal range. Will recheck in 3 months. (thyroid panel 2) If he is becoming hyperthyroid, it can complicate his diabetes and cause additional concern as it can cause progression of his heart murmur/heart disease. Frutosamine results were a bit lower than expected. Biggles may be running a lower glucose level at home than what is desired. Will do a home test of 3 readings. One prior to insulin injection and then 3 additional readings, every two hours. May need to reduce insulin down based on results. January 5, 2016: Biggles began 2015 on a positive note. His weight and appetite continued to be clinically fine. He was vomiting occasionally. But nothing that was continual or frequent. 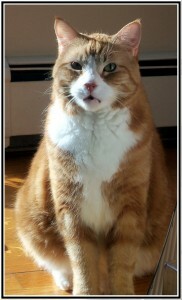 We did a senior blood panel in January, 2015 to monitor his thyroid levels. He was higher than the last blood test and was prescribed a dose of ¼ tablet of methimazole (twice per day). Biggles continues with this dose currently. Also requested by his vet, we did the 6 month curve to ensure that his diabetes was controlled. A glucose curve done in mid-February showed his diabetes was controlled and within normal range. His pre insulin number was 178 at 7:30am. The first blood drawn 2 hours after his injection was at 125 and continued to climb slowly with each sample, two hours apart. The highest number at around 4pm was at 189. We have exclusively been giving him 2 units of Glargine, (twice per day). 3 ½ was concerning due to his eating patterns. Biggles seemed to show signs of low glucose when we did give him the higher units. In April, 2015 Biggles seemed to be losing weight. He was 12 lbs 4 oz down from his last visit when we had him checked at our local vet in October. We made an appointment with his internist for blood work and ultimately an MRI. Biggles’ vet recommended that we do an MRI to rule out any other underlining issues causing his weight loss. All organs appeared to be in good shape for a diabetic cat of almost 16 years of age. A slight dark area was noted on his lungs. We did not go further with a more invasive needle biopsy at that time. Decided to take a more conservative approach and monitor for any additional concerns. Biggles gained back weight and was at 12lbs 9 oz as of his last vet checkup in September. I have given him only a few doses of Pepcid A/C in the last year as he is doing well digestively. October, 2015 I observed that Biggles seemed to have trouble walking. He also had a very poor appetite for a few days. He clearly showed limping in his back legs and a lot of muscle tone has been lost in a short amount of time, which concerned me due to his previous neuropathy due to uncontrolled diabetes. He saw his local vet for this concern. Nothing broken or sprained was detected. His vet also noted that he did not see clinical signs of it being neuropathy. Biggles has developed arthritis and possibly twisted his back legs when trying to jump up or down. No pain meds were given due to the complications that may occur with his other health concerns. We were asked to monitor him and any additional concerns or worsening of his condition to bring in for additional tests. He was given Cosequin For Cats. We sprinkle a capsule on his food twice per day. The severe issue seemed to resolve itself in a few weeks. He clearly has joint concerns in his back legs. But he is active, alert and eating normally. January, 2016: Biggles had his exam and blood work up done in January, 2016. He is at 12.6 lbs. His vet noticed a racing heart rate during his exam and prescribed a beta blocker (1/4 tablet of Atenonol, once per day). Biggles bloodwork showed normal thyroid levels, and Fructosamine levels showing controlled Diabetes. Blood work did indicate a slightly elevated BUN level that would indicate an additional concern of kidney disease. It was noted that only bloodwork and no urine test was done and we should consider that testing, as well. We brought Biggles in to have them get a urine sample. The urinalysis showed diluted urine and she suggested that we run an additional test to measure albuminuria levels. Albuminuria is a well-known predictor of poor renal outcomes in patients with type 2 diabetes and in essential hypertension. The levels were slightly high, indicating that Biggles kidneys are not working as well as we would like to see. Not at concerning levels, however, where medication would be recommended. Biggles has an appointment with his internist in a few weeks to review his most current test results. March, 2016: Biggles appointment to review test results did not indicate any need to change current dosages or further lab testing. Taking periodic heart rate numbers along with a six month at home glucose curve was recommended by his doctor. Biggles will have a recheck by the end of 2016. Biggles curve done in mid-summer showed good control of his diabetes. He was reduced to .5 unit of Lantus(glargine) 2 times per day. December, 2016: Biggles appointment reviewed his current medication dosage and heart rate/kidney concerns. Heart rate was high and an echocardiogram was recommended due to this issue. The results were positive and no hardening or additional concerns were noted that are not typically seen in a 17+ year old cat. Kidney function remained consistent with summer test results. Biggles was showing signs of remission of his diabetes and was taken off insulin for several days with a BG check to be done late week. The BG check was done on Friday of that week. Indicated a value of 320. This shows he still needs some insulin and was put back on 1 unit – 2 times per day. We will do a curve at the beginning of January. Curve was a bit high at start of readings at 287. But not enough to change current insulin dose. Will recheck in one month. March, 2017: Biggles continued to remain stable other than some constipation and water drinking seemed to increase. This may be attributed to the minor constipation. To help, he is given a quarter of Mirilax every other day. He continues to take Atenolol 1/4 tab – once per day and Methimazol – 1/2 tab in the morning and 1/4 at night. Due to the low reading, Biggles insulin was changed immediately by his internist to .5 unit, 2 times per day. April, 2017: Biggles visited his local vet for his rabies shot. A senior panel bloodwork was performed and fructosamine test was done. Blood work did not show anything concerning in his kidneys and liver function since last test results. He did show a minor pancreatic flare up. Biggles did lose .5 lb. since December. The flare up of pancreatitis could attribute to a lack of appetite. He had been doing well and we backed off of giving him Pepcid A/C. However, we are now giving him ½ tablet no more than once per day, more regularly to ward off issues and prior to him becoming painful. Biggles fructosamine reading was 380. He will remain at .5 units, 2 times per day. June, 2017: Biggles is due to for his 6 month check up with his internist and determination of further tests of adjustments of medication/insulin is warranted at this time. This appointment is scheduled for July, 2017. November 2017: At Biggles’ check up, he was diagnosed with stage III CRF. Most of his numbers were good, phosphorous, protein, hemocrit normal. BUN and Creatine moderately elevated. We will be giving him an Omega 3 supplement. Changing his diet will be difficult. He is finicky and we have to also consider the proper diet for his feline diabetes. Biggles’ right canine tooth had a swollen gum line. Appears to be an abscess. Will monitor for worsening. Biggles will go on antibiotic for 14 days. January 2018: Still showing normal levels of phosphorous and potassium. Hemactocrit levels are still in normal range. Slight trace of protein in his urine, BUN, and Creatine levels have gone down since November. No indication of Anemia. Biggles tooth and gum redness cleared up after round of antibiotics. May 2018: Biggles last examination and check was on May 24, 2018. He showed slight worsening of his kidney disease, and clinically, he showed worsening of his hind leg strength. Will try giving him ½ pill twice daily of Gabapentin. Previously 1 pill, twice per day has caused him to be very lethargic. His canine tooth that showed some signs of abscess in November 2017 looked fine. No additional disease concerns and no worsening of his thyroid or heart disease. No changes to his atenolol or methimazol dosage. His diabetes showed BG curve results that indicated he was no longer regulated in the spring, 2018 and was working with his internist to determine the proper insulin dosage. He was drinking more frequently and was showing high BG readings most of day in the high 400 range. He was receiving a little less than .5 units of Lantus, twice per day. We increased his dosage to ¾ unit twice per day for 5 weeks and did another BG curve on 5/26/2018. Remained at that insulin dosage despite a few peaks in readings. Ate well and had 3/4 unit of insulin at 8:47 am. Summer, 2018: We could see Biggles slowing down as we went through June and July. Although he did not seem to be in pain, he could no longer jump up on the sofa and did not want to sit on laps or cuddle as much as he did before. He would go to his litter box. However, he had trouble getting into the box. His appetite was up and down. However, his good days outnumbered his bad days and he always rebounded positively after a difficult day. He still loved to sit on the top step in the sunshine. We let him do that anytime he wanted to sit with us for a while. The weekend prior to his passing on Monday, August 13, 2018, he only would lay on his side. He showed a little interest in food. But we had to go looking for him rather than him coming to us as he always did. We decided to take him in that Monday because his breathing had changed. His heart rate was at 88 bpm and his body temperature was low at 99 degrees. Biggles was alert although the rest of his body was letting him down. We knew it was time to say goodbye to our ray of sunshine after 19 years of unconditional love.